As pictured. Good size for bedside table. 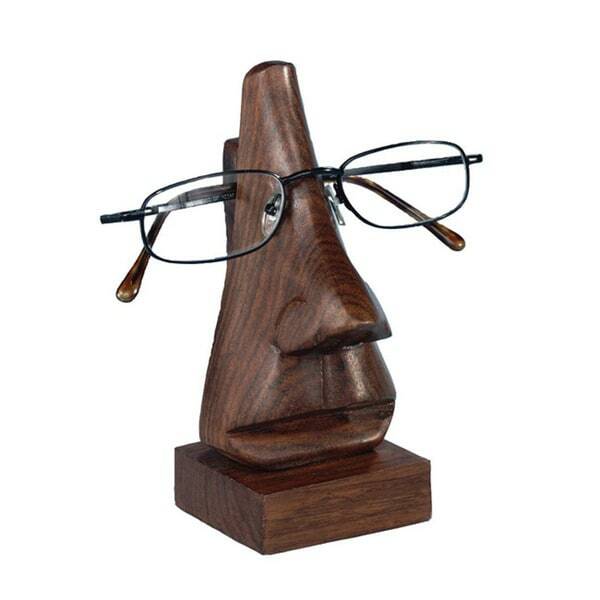 Never lose track of your glasses again with this quirky, wooden face eyeglass holder. Equal parts artistic and functional, the hand-carved eyeglass holder resembles an abstract human face. A convenient ridge on the bridge of the nose holds your glasses securely between uses, and a wide base prevents the unit from tipping. Meaning "motherland" in Hindi, Matr Boomie was started in 2006 by Manish Gupta. After years of living in the States, Manish took a trip back home and was struck by the extreme poverty he saw in many areas. He began to think of a ways to bring about positive change that was also ethical and sustainable. After hundreds of conversations, he had an idea. Partnering with grassroots organizations and artisans, they could teach local men and women to become skilled makers in ways that honored the rich traditional art forms of India while making them relevant for modern consumers. Today Matr Boomie empowers over 20,000 makers in over 40 communities throughout India, creating a wide range of items, from jewelry, gifts, and fashion, to leather goods and home accessories. Adhering to Fair Trade practices, the Matr Boomie collective pays 25% over the standard local wage. The also invest in social development projects, such as education, health, computer literacy, clean water, and other training programs in the communities they work with. I love this item!! I bought four of them so far...they make a great inexpensive gift for anyone who wears glasses...even sunglasses! They are hand carved out of beautiful wood and are cute, kitchy and useful...what more could you ask for? So far everyone who has received one raved over them and wants to get some for their friends. I love that each one is unique in wood grain and slight variations in color...it almost makes you want to name them! If you want a gift for someone and don't know what to get them...this is a perfect choice! The Wooden Face Eyeglass Holder (India) is a great thing to have...you know where your glasses are at all times. I have to preface this by saying that of the hundreds of purchases I've made online in the past 15 or so years, I've never once submitted a review of any purchased product... That said, I am completely pleased with this clever little way of holding eyeglasses. My father has been perpetually misplacing his reader glasses for as long as I've known him. Of the 10 to 15 discreet pairs he's actually purchased and re-purchased in the past few years, he can usually locate between zero and none of them at any given time. Enter the Wooden Face Eyeglass holder. The product is exactly as pictured and despite my worries about quality of craftsmanship, it is perfectly suited for a casual desk at home or as a conversation piece on an executive desk at work. Now his glasses have a convenient, funny and stylish home base that they always return to when not in use. His first comment after realizing what this was, was "Can you find me another one so I can have one at home and at work?" If I were forced to find something negative to say, it would be that the glasses might not sit completely level on the "face" if you have your nose bridge pads tweaked for your nose in a weird way. Not really a concern to pay much mind to. I purchased 2 of these glasses holders for home use and enjoyed them so much I bought an additional 3 to give away as gifts. They are all exactly the same in terms of size and construction, the only variation being subtle changes in the wood grain and colour (as a result of the grain). They are well crafted, smooth to the touch, with a soft satin sheen appearance. I have several pairs of glasses with various lens sizes and shapes and all of them fit well on these holders. Their is enough base weight that they are not prone to tipping over and when not holding glasses they are interesting art objects - little Easter Island monuments. When I saw this Wooden Face Eyeglass Holder, I knew immediately who would receive it as a gift. The person who I purchased it for is very special and loves unique and different items. My intention was to give it as a Valentine's gift, but after about 3 days of receiving it I couldn't resist. So now I have to think of something else for Valentine's. He was so excited when he opened it and continues to tell me how much he likes it. My only regret is that I didn't get more than one at that price. Thanks for sharing such a great and unique product. I purchased this years ago,and use it many times every day. Its convenient sitting on the back spot of the counter, or side table. This wooden face easily holds up to 4 pairs of eyeglasses. This wooden face eyeglass holder is such a cute place to store my reading glasses! The quality and finish is very nice too. This little guy is sooo cute!! I purchased this wooden mini-sculpture for my husband as a small Holiday gift so he wouldn't misplace his eyeglasses and I think I love it more than he does, but he does like it too. It looks soo adorable on a nightstand or table or shelf, and the wood is good quality. It's actually a piece of ART, and functional at the same time (I LOVE functional art!) So, I think it's a hit! I wouldn't hesitate to buy another one of these as a gift for anyone that wears glasses... Heck, even SUNGLASSES look cute on this guy! LOVE HIM! Looks great on my nightstand and keeps my glasses out of harms way. The notch along the back of the sculpture is wide enough to accommodate a thicker plastic frame as well as metal, and my glasses sit nice and level on the stand. I may have to order a couple more of these for gifts. The "carving" is somewhat primitive and just a little more attention to the details (around the lower nose and nostril area it could have used a bit more sanding, smoothing) would have made for a five star rating....but overall, I am very satisfied with the purchase. This is a beautifully carved item. My husband has special glasses for his computer work at the office, so one pair of glasses is always sitting on his desk. He was just delighted with this item, a most unique item, and likely a bit of a conversational piece among the guys at work. I sure do recommend it. Is a very unique gift. The carver is very talented in his work. Looks like the picture ,adds character to my desk,and my friends often ask where I purchased it,it works well for its purpose,and now I always know where my glasses are. Funky cute and it works! Keeps glasses out of the way and in a place where you can find them. These eyeglass holders are perfect. We purchased two, one for each nightstand. My prescription glasses have a medium frame, and they fit perfectly. My prescription sunglasses are an 80s, "Risky Business" thick frame, and they fit perfectly. David's prescription glasses are a very thin frame, and they too, fit perfectly. And, these holders are adorable. David and I were playing with them, until we decided we embarrassed ourselves. I love this for holding my glasses but it's also an art piece as it looks nice while empty. Cute idea for someone who's always losing their glasses on their desk. Gave it to my boss as a "gag" gift and he loved it - also helped him from stretching out his glasses from putting on his head to much. So cute! I bought this as a gift for my boyfriend, who was always losing his glasses. We placed this bedside, and it was like a little piece of functional art! Love these little guys! I've ordered several to have in different areas of the house so I always know where to find my glasses. It is practical and artistic. Interesting & may help me keep track of my glasses on my desk if I train myself to use it. To used when I store my glasses..
"Does this item hold only one pair of glasses or more?" Hello elan111 , This item was designed to hold one pair of glasses. Thank you for shopping with us. "Thinking Man" Sculpture with Bronzed Finish on Marble Base.